My name is Brian Winch, and I want to share with you a home business opportunity that may change your life forever. If you’re looking to start your own business and take control of your life, CleanLots might be just what you’ve been looking for. I started in 1981 providing a “niche” service for commercial property management companies. We clean litter from parking lots, sidewalks and landscapes of commercial properties. We use just a broom and special litter scoop tool and walk around the properties keeping them clean. Almost as easy as a walk in the park!. Read about The Opportunity. For over 30 years I’ve been earning a 6 figure income from what amounts to going for a walk each night. I’d like to share with you how my business works to help you duplicate my success. No, I’m not selling a franchise or some new internet business model. I’m here to show you how to provide an essential service to the business community in your area and earn a good living working for yourself. Here’s your chance to make a difference, to take pride in knowing your “green industry” business provides for a cleaner environment. 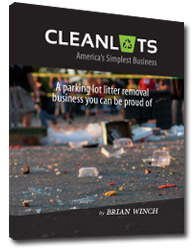 I’ll show you how to “cash in” on this recession proof and growing field with your own parking lot litter cleanup business. I’ve prepared a training manual to teach you how to operate this business. The cost is only $79.95 and I even include FREE phone support to get you started. It’s our little incentive to get you off your back side and into business for yourself. All you need is the drive and determination to implement my proven business and you’re on your way to taking charge of your life. It’s not glamorous, but I continue to make a six figure income every year because most people are quick to dismiss this simple yet lucrative service. All it takes is a few minutes each day, at each property to keep the sites litter-free. If you’re looking for a simple, low risk business with the potential to earn you a 6 figure income, order the manual right now. We’re here to help you succeed, but you need to Buy The Cleanlots Manual to get started.